I won't get satisfied unless I taste breakfast along with some kind of chutney. Chutneys play a major role in many south Indians like me. Sometimes just for chutney, I used to eat extra number of idlies or dosas than my usual intake. Though we prepare many number of chutneys at home (source: Mom, MIL, Paati, Athai,chithi and my blogger friends :-)), I had posted only few of them in my blog. 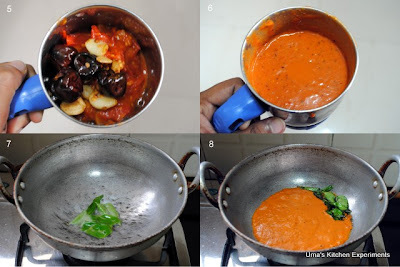 When Sangee and other friends of mine asked me to post tomato kara chutney from this post, I realised I have not yet posted this chutney so for. This recipe is from Raji Athai and she prepared it for all of us when she visited our home once. The colour of the chutney simply attracted and the taste was also awesome in her preparation. As a food blogger what else I do? Followed her recipe and made many times till now as a condiment for idly, dosa and now sharing it with you all. Remember, It pairs well with idly and all kind of dosas. So, prepare at your home and enjoy often like me. 1) Heat 2 teaspoons of oil in a kadai / frying pan. 2) Add dry red chillies and garlic cloves. Fry till garlic becomes soft. Transfer to a plate. 3) Add sliced tomatoes to the same pan. Fry till the raw smell of tomatoes goes off and also it mashes well. 4) Transfer this mashed tomato to the same plate and allow the ingredients to cool to room temperature. 5) Once cooled, put them with salt to the mixer and grind it to a smooth paste. 6) Wash and heat the same frying pan. Pour the remaining oil to it. 7) When it is hot, add the mustard seeds and let it crackle. 9) Pour the ground tomato spice paste to the pan. 10) Wait till the oil oozes out from the tomato paste. Make sure not to burn the paste. Add asafoetida now. Cook for 2-3 seconds only. 11) Transfer to serving bowl and enjoy with dosa. 1) Use ripe tomatoes for best results of taste and color. 2) Increase or decrease the number of dry red chilies as per your spice level. 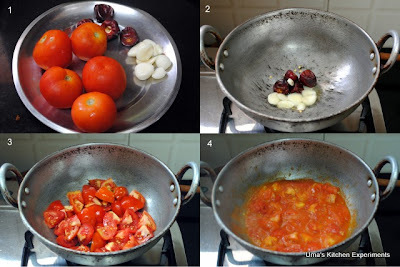 3) Add a pinch of salt and cover the tomatoes using a lid for quick cooking of tomatoes. Colourful and inviting chutney,i can have two more idlis with this chutney. Lovely chutney with a deep red colour that makes it seem even spicier than it is ! Nice pictures too! Looks so inviting.. Nice clicks as usual uma. Nice Bit Different from My Recipe would love to try it. First time here,to you blog you nice collection of Recipe. so good color n flavor..